The green mountains offer more than just snow covered hills for winter thrills. Ski resorts statewide also offer an authentic Vermont experience during the summer. Whether guests want to connect with nature and family, seek an adrenaline rush, or both, resorts are ready to deliver. Want to walk on air, or whisk through the woods this summer? Challenge yourself to new heights at Bromley’s new Aerial Adventure Park, set to open in early July. Or visit the expanded Adventure Zone at Okemo, which features a new zip line canopy tour as well as an Amp Energy Big Air Bag – a giant inflatable pillow similar to those used by stuntmen. Once you’ve had your time in the trees, travel up north to flip and soar up to 25 feet in the air at Sugarbush on their new EuroBungy trampoline. Looking for something more down to earth? Grounded in family fun, Smugglers’ Notch delivers. Take the family on a llama trek, or enroll the kids in a wilderness survival or skateboarding camp. You can still get your aerial thrills here too, with ArborTrek’s zip line canopy tour – rated one of the best in the world! May 26-27, Stratton Mountain: If your love of winter still permeates the forefront of your mind, don’t miss the MAY-hem Rail and Jump Jam on Memorial Day weekend – featuring real snow! June 17, Burke Mountain: Watch record holding, championship lumberjacks from New England and beyond compete in a variety of competitions at the 4th Annual Vermont Invitational Lumberjack Competition. June 22, Sugarbush Resort: Kids own the spotlight as Sugarbush celebrates opening day with free mountain bike clinics, swimming and a BBQ. July 14-15, Mount Snow: Tough Mudder New England #2 – participate or watch as challengers get down and dirty in this contest of physical fitness and teamwork! The fun doesn’t end with these highlights. Golfing, hiking, lift access mountain biking, swimming, disc golf, alpine slides, and more can be found at participating resorts. For more information on spectacular Vermont mountain adventures, visit www.skivermont.com. Stratton Mountain Resort is ringing in its 50th birthday this Friday, December 23, with a bash for the ages. Set amid a season-long celebration of heritage, tradition and progression, this full day party is sure to delight skiers and riders of all ages. Whether it’s a toast and birthday cake or a mountain-wide scavenger hunt that pique your interest, it’s on tap at Stratton. 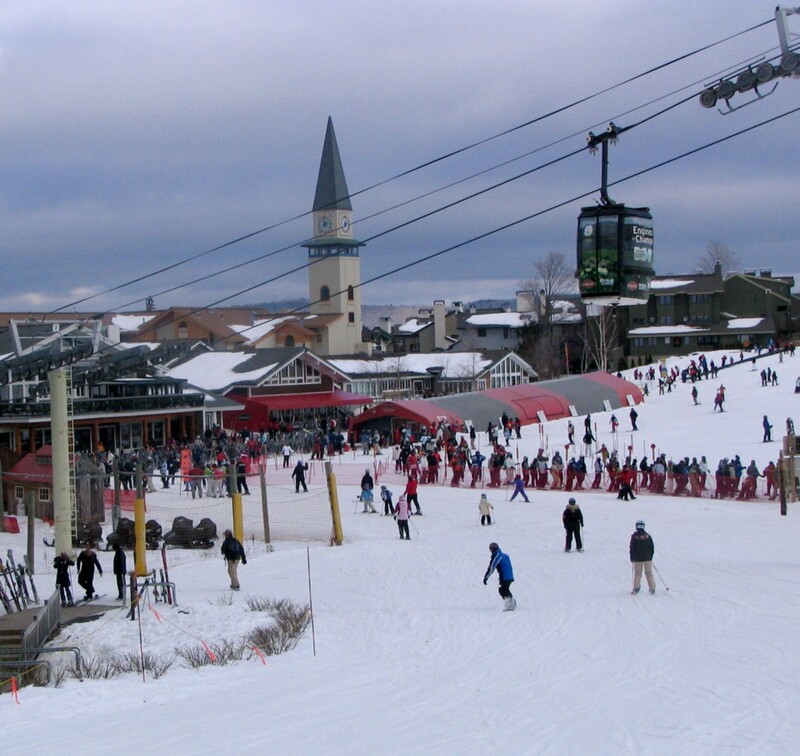 From day one, Stratton was a lively resort community in a world of day ski areas. Golf and tennis soon made Stratton a year-round destination. Among the first to adopt snowmaking and add high-speed six-passenger lifts, Stratton is also renowned for being the first major resort to welcome snowboarding. Today, Stratton is in the throes of a full blown snowmaking attack, opening six new trails this morning and looking to add several more for the holiday. Head up to Stratton for a blowout birthday celebration and toast to the next 50. Get those anniversary turns in for less. On Stratton’s birthday, everyone skis and rides for just $50; book online in advance to purchase your Stratton party favor! Watch the ski school instructors as they put on a stunning display down Suntanner. 9:00am on Suntanner. Be sure to be by the base to catch a glimpse of this beloved Stratton tradition. Narrated by Emo Henrich, featuring footage from Hubert Schriebl and Mary Alice Fisher. 4:00pm in the Base Lodge, West. Find the watermelon and win a 50th Anniversary Signature prize. Pick up details at the Information Desk in the Base Lodge! All day. Refuel at Grizzly’s! Special addition to the menu includes retro fondue and 50th Anniversary Signature Beer. All day. At the 50th Anniversary Welcome Table in the Base Lodge. All day.